The 2013 Nevada Open Road Challenge (NORC) was attended by Mark (The Professor) Skwarek and Dennis (Mad Dawg) Antenucci. 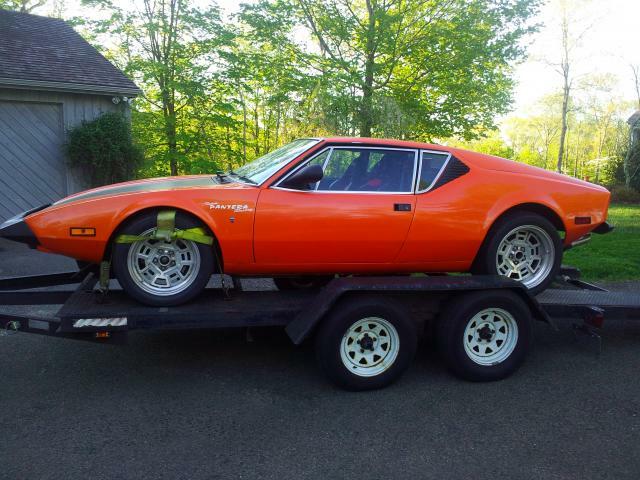 The Dawg has been shuttling around with a new contract job and wasn't able to bring his Pantera for this event. This may have been the first event Dennis has missed in many years, but he still managed to attend and play pit-crew for Mark who was ready an rearin' to go. This illustrates the enthusiasm Dennis carries and tries to foster among those Pantera owners who wish to race in Open Road events such as this. Mark entered the 125 class this year and finished with an average of 118.51 due to a small engine problem during the race. It seem he lost an oil breather on one of the valve covers. Driving at speed to average 125 caused so much oil fog that Mark had to drop it down a notch and reduce the oil blowing out. At the lower speed he wasn't causing a hazard on course and was still able to finish the entire 90 mile course. With this successful run Mark can again move up in classes. He's already beginning to talk about taking on the Unlimited division in the near future. It was 25 years in the making and it all came off without a hitch. 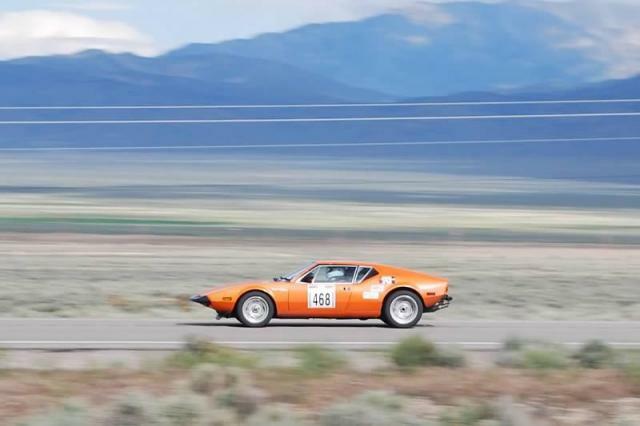 2012 was the 25th Anniversary running of the Silver State Classic Challenge open road race. Team Pantera racing had a strong attendance at this year's event, with five members either driving or supporting. Two TPR veterans and one rookie successfully entered and completed the race, each in their own speed class. For Dennis "Mad Dog" Antenucci, this years event was one to remember. If not for the valiant attempt to repeat the most Panteras ever entered, but for the team spirit of everyone present who managed to come and put forth an effort. Rich Hoppe returned this year sporting a different Pantera; the original Round Table Pizza race car, re-imagined and re-engineered into a formidable powerhouse of a Pantera. John Bentley returned for a stab at the silver plate as well. New this year was Asa Jay Laughton, who had been trying for the last four years to make the race. John trailered his Pantera behind Team Pantera Racing Cafe' Finito, a large motorhome that served as TPR headquarters in the back lot of Hotel Nevada for the duration of the event. In addition, Peter Menyhart came to support the team while his Pantera is being reconstructed at home. Peter's help was welcome when John discovered he needed a new alternator and regulator in order to keep the Pantera running. In an unfortunate turn of events during tech inspection however, John was disqualified due to over-age tires. The unfortunate turn was that he had purchased the tires only two years prior but hadn't noticed the date codes were already six years old. There's a lesson in there about requiring the vendor to check dates codes before they ship them to you. Dennis decided to enter a slower class in order to take time and enjoy the scenery. Even in the 135 MPH class though, he couldn't resist pushing the envelope, finishing at just over 140 and feeling comfortable in doing so. Meanwhile Rich Hoppe and the Round Table Pizza Pantera entered the 140 MPH class and finished just over 136 MPH, proving once again, Dennis was top Dog. The rookie, Asa Laughton, was limited to the Touring class, and chose 105 MPH with fewer entrants. He was tentative about driving the 90 mile course flat out at 105 and was receptive to all the advice from all the Veterans who really looked out for him on his first time out. After months of preparation and only a couple days of final checks and sage advice, Asa finished with an average just over 108 MPH. He said later he was just so excited about how well the car was running at high speed, he forgot all about the plan to keep it down to just around 106. With all smiles after the race, the team made their way to Las Vegas for the banquet. Being the 25th Anniversary running of the race, Silver State Classic Challenge Inc. pulled out all the stops. They held the banquet in the large showroom at Sam's Town. There was video playing, slide-shows, various speakers and of course, the awards. It was a great celebration of both the event and the racers who run it. Check out the Gallery for photos of the event. Here's a link to TV station coverage of the race. You can read more about Team Pantera Racing adventures at the Sandhills Open Road Challenge in the 2010 No. 4 issue of the POCA magazine Profiles. Once again, Team Pantera Racing members from the midwest are heading to the Sandhills Open Road Challenge. This year we have three members committed to go and we wish them all the luck in the world. The Sandhills Open Road Challenge is one of the best Open Road Races there is. It's a two-stage, there and back again race with an intermission between the two legs of the course. Plenty of twists and straight open road... and unforgiving ditches on either side. Many drivers claim this race to have some of the most beautiful scenery of any open road race in America today. The town of Arnold Nebraska has benefit from this race so much in years past, they are very happy and very helpful in hosting the race each year. Most townsfolk come out to help with tech, put decals on cars, put on a parade and barbecues. Since there are no hotels in Arnold, they even open up their homes to host the drivers for the event. It's all around a great time.